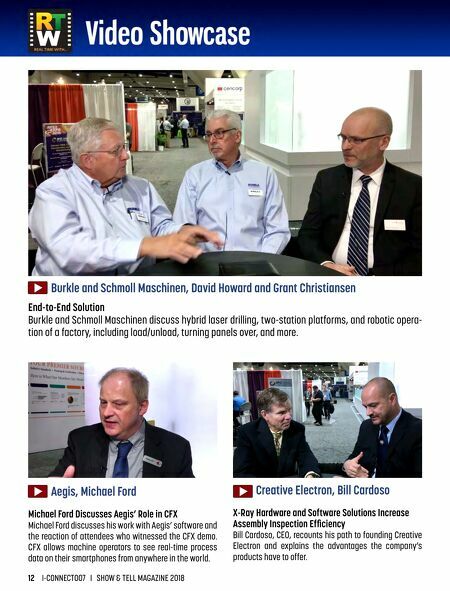 12 I-CONNECT007 I SHOW & TELL MAGAZINE 2018 Burkle and Schmoll Maschinen, David Howard and Grant Christiansen End-to-End Solution Burkle and Schmoll Maschinen discuss hybrid laser drilling, two-station platforms, and robotic opera- tion of a factory, including load/unload, turning panels over, and more. Aegis, Michael Ford Michael Ford Discusses Aegis' Role in CFX Michael Ford discusses his work with Aegis' software and the reaction of attendees who witnessed the CFX demo. CFX allows machine operators to see real-time process data on their smartphones from anywhere in the world. 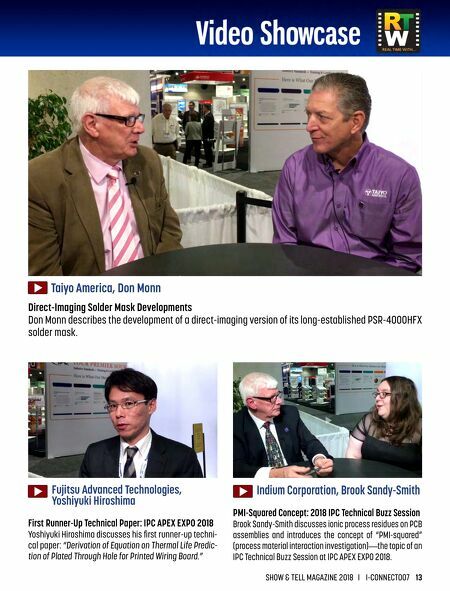 Creative Electron, Bill Cardoso X-Ray Hardware and Software Solutions Increase Assembly Inspection Efficiency Bill Cardoso, CEO, recounts his path to founding Creative Electron and explains the advantages the company's products have to offer.